I didn’t plan on doing this tutorial since part 9 of this series, but I wanted to add a few features. I go into detail on those features after the video. 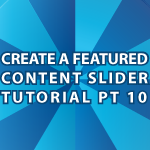 I also wanted to show you how to use the Featured Content Slider I made for WordPress. All of the code is available in a zipped archive. I’m not going to upload this to the WordPress plugin depository, so this is the only place to get it. Don’t worry it is still free to use however you’d like. If you missed part 1 of this series, it is available here WordPress Featured Content Plugin. There were only 2 changes made since last time, but they are important changes. The zipped archive above already contains these fixes! I think the comments are self explanatory. I made this change so that this plugin will automatically figure out what site it is being hosted on. So, now you know how to use realpath to find the absolute path name for a website. On line 272 of this file I added a regular expression, followed by the letter g like this /\/s\g. This allows me to replace all spaces with dashes. The previous code only replaced the first instance. Just a silly bug. I really enjoyed doing this tutorial. It was fun to teach a more challenging topic. I’ll now continue with my tutorial on how to create a WordPress News Theme. Part 1 of that series is here if you want to be prepared. Derek, this absolutely amazing stuff!! i can’t claim i understand everything that’s going on in real time, but it’s great material for me to study and your explanations are super. i might be completely dim, and have totally missed the point here, but is there a simpler way of a achieving this than to do use arrays and the featured-category which you’re showing us here, to be able to get to that info? sorry if i’m confusing this altogether.. I might temporarily be suffering from input overload..
thanks as usual for all your work! I’ve checked that series out now, but sadly I’m not finding the part where you make the coda slider worth with wordpress.. as usual i’m assuming that i’m missing something obvious, or haven’t you got around to it yet? thanks for great tutorials as always!